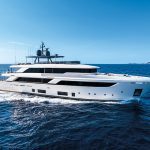 The path chosen by Custom Line has proved to be the right one and the Navetta series is meeting with considerable success on an international level. The product is a very good one, with great attention to style and technical features, and is built upon the group management’s thorough knowledge of this market segment. 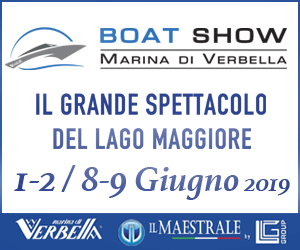 We are talking about a market segment that includes semi-custom medium-large fibreglass yachts with semi-displacement hulls and plenty of scope for customisation, both as regards the interiors, fittings and layout, and as regards the technical solutions, first and foremost the engines. The experience of the builder and designer, Zuccon International Project, is clear to see. The external lines are dynamic and flow seamlessly into one another, with no discordant features or oversized volumes. The interiors benefit from the same harmony. Putting every last centimetre to good use, they are arranged in a practical fashion and both the communal and private areas are spacious and comfortable. 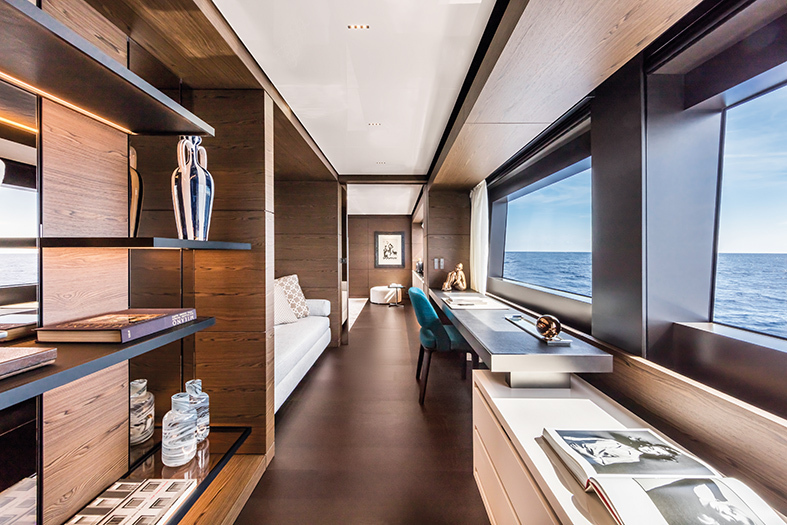 On the main deck, the wide body configuration from the midship towards the bow has made it possible to create a very large master cabin with sleeping area, study, double wardrobe and double bathroom. The master suite also boasts a wonderful little balcony, which is the perfect place for eating breakfast or reading a book in complete tranquillity when at anchor. 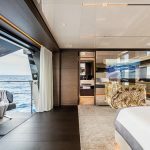 In the case of the master suite balcony, a portion of the gunwale pulls out from the side of the yacht, rather like a large drawer, creating a floor surface that can easily take a small table and a couple of chairs. 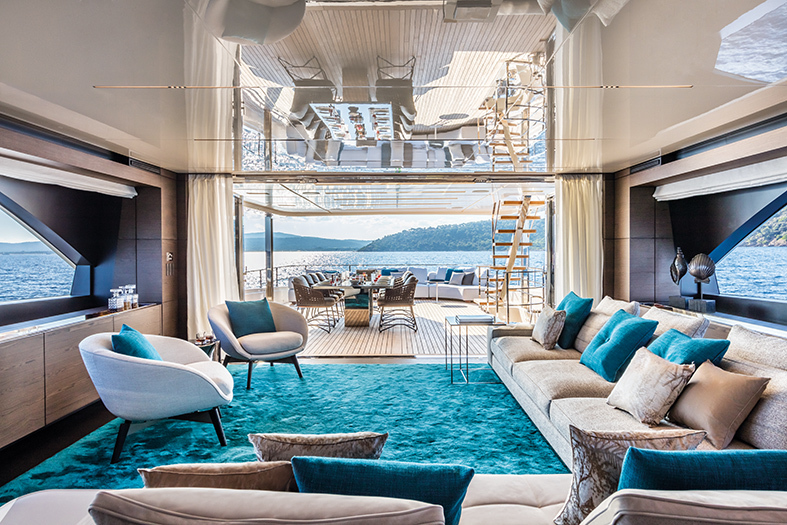 Another two balconies (drop-down in this case) open out on the sides of the main deck next to the dining room, which occupies the bow section of a large open-plan lounge. The starboard balcony comes as standard, while the port balcony is available on request. Despite being relatively small, these various openings have the extraordinary ability to create a sensation of space that goes far beyond the effective square meterage. 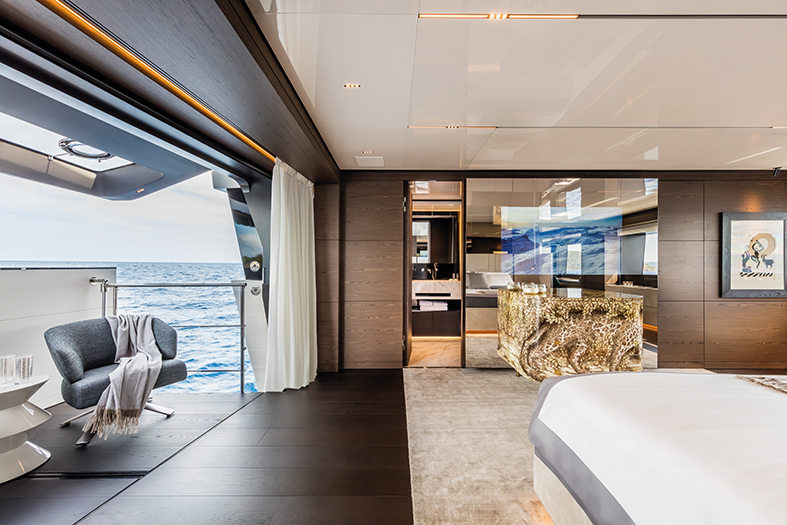 The sensation of interior space is also enhanced by the height of the ceilings that always approach 2 metres and the large windows that allow plenty of light to enter, while also making it possible to admire the ever-changing seascape. We won’t give a detailed description of the furnishings and materials because, as we have already mentioned, each unit is made to the individual owner’s requirements. 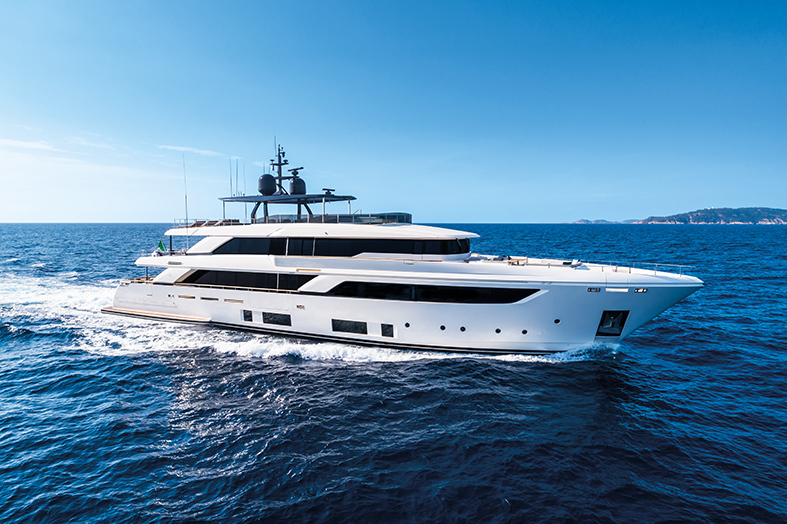 The Navetta 42 has three main decks plus a spacious sun deck for enjoying the great outdoors. 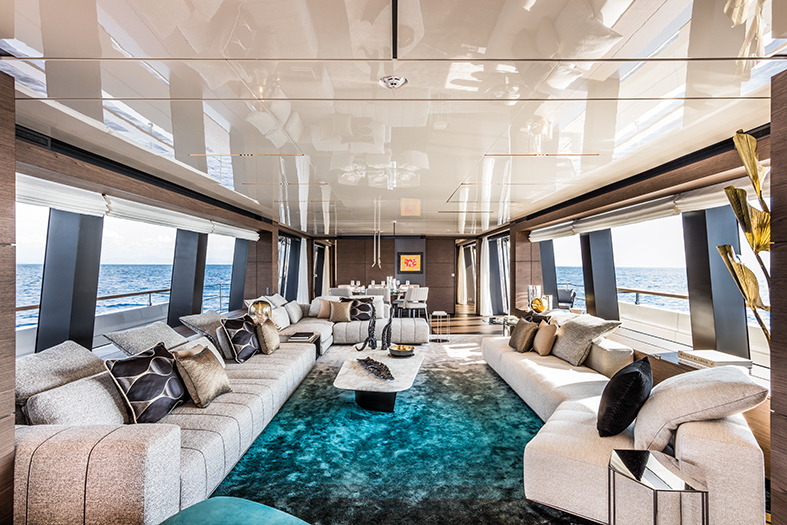 The main deck contains a large cockpit, which can be fitted with freestanding furniture at the owner’s request. A sliding glass door leads into the main lounge, divided into a sitting area and a dining area. Continuing from the lounge towards the bow, we come to the lobby, where a lift linking all the various decks can be installed. In unit number one, which we visited, the lift travels from the lower deck to the upper deck. In the standard layout, the galley and a large pantry are on the left with direct access to the crew area on the lower deck. Continuing further towards the bow we come to the bright and panoramic owner’s apartment, measuring around 50m2. The guest sleeping quarters are below deck. The standard version contains four cabins, of which three are doubles and one is a twin. The layout on this deck may vary depending on whether or not the lift is installed, but it is large enough to ensure that all the guest cabins are spacious. 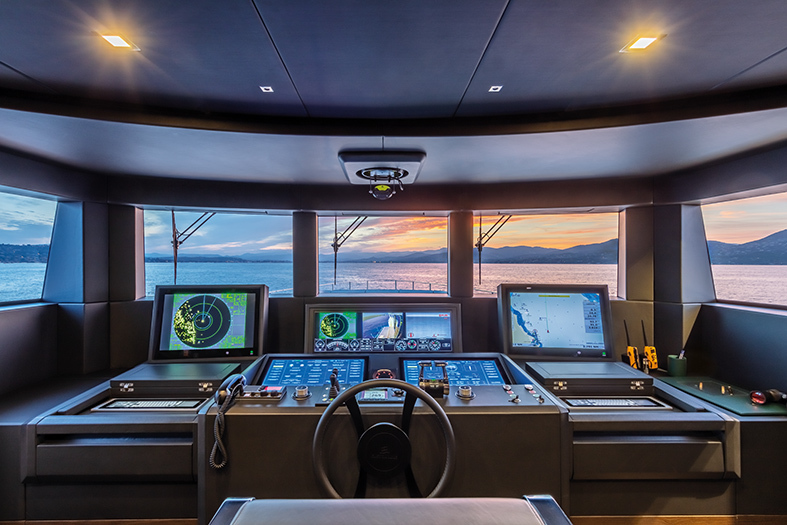 On the upper levels, the top deck houses an attractive panoramic lounge, the captain’s cabin and the steering position, including a dashboard developed in partnership with Team Italia. 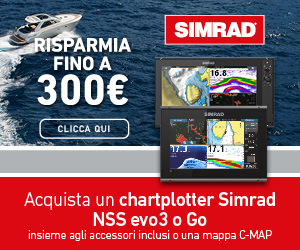 The integrated dashboard includes five screens, two of which are touchscreens. 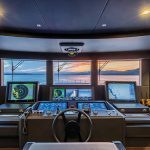 Everything on the yacht is controlled from here. 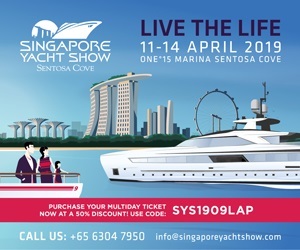 The yard offers a broad selection of engines: the yacht comes with two Caterpillar C32 Acert V12 1623 HP engines as standard, but you can also opt for two Mtu 12V 2000 M86 1725 HP engines, two Mtu 12 V2000 M72 1469 HP engines or, as in the case of unit number one, two Caterpillar C32 Acert 1470 HP engines that give the Navetta 42 an autonomy of around 3,000 nautical miles at 10 knots and a top speed of 16 knots. The performance obviously changes according to the engines. In the stern section of the top deck, sheltered by the protruding sun deck, is an attractive outdoor dining area, which is probably the most used dining area on board. The crew can serve the area easily via the pantry adjacent to the indoor lounge, linked to the galley by means of a dumbwaiter. 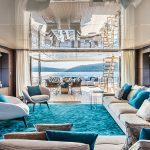 A roomy outdoor relaxation area, divided into two sections with seating zone and sunbathing zone, has been created in the stern section of the top deck. Both zones can be shaded by canopies and protected from prying eyes thanks to side awnings. The bow garage, located beneath the sunbathing zone, can house a tender or a personal watercraft. 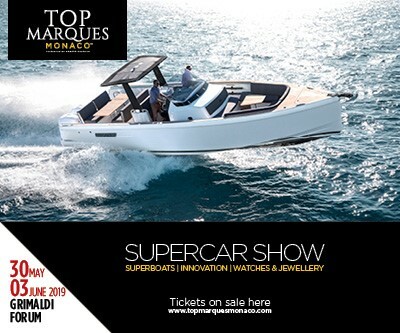 Meanwhile, the main garage with side opening is on the lowerdeck and can be accessed directly via the large beach club in the stern. Let’s go back up from sea level to the sun deck, the perfect place for outdoor living. This is a wonderful spot to while away some very pleasant hours on the sunbeds, cool down in the little pool and drink an aperitif at the bar. 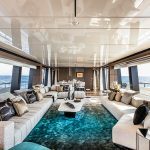 However, I doubt the owner and his or her guests really need my suggestions on how to make the most of this relaxation area or any of the other delightful interior and exterior spaces on this magnificent yacht!